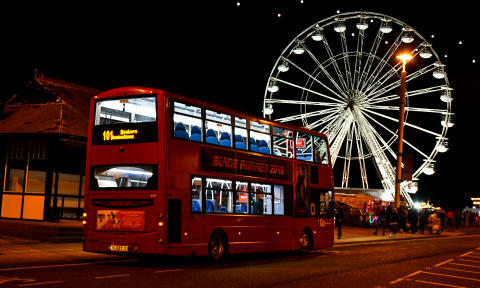 Over 21,000 people hopped aboard Go North East’s dedicated 101 park and ride services this October and November, to visit Sunderland’s annual Illuminations (5 Oct - 5 Nov). Staged by Sunderland City Council, more than 200,000 visitors the seafront to enjoy the Festival of Light event in Roker Park, Illuminations from Seaburn along to Roker and firework display finale at Cliffe Park. The Sunderland Illuminations were open every night 5-10pm with fairground rides and stalls, while the ticketed Festival of Light in Roker Park was open every Thursday, Friday, Saturday and Sunday, plus every night at half term, with Disney-themed light displays and new attractions for the whole family to enjoy. 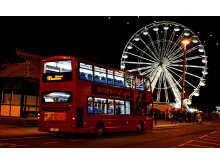 To help cope with traffic congestion on the seafront, the region’s largest bus operator Go North East provided park and ride services for visitors. Buses ran every 20 minutes from Keel Square via the Wheatsheaf, Newcastle Road and Sea Road, and dropped off at Seaburn tram shelter. Anyone parking in St Mary’s or Sunniside car parks, who showed their parking ticket to the driver, also enjoyed complimentary travel to the event. For the ease of visitors, Go North East also advertised its park and ride services across its network of Wearside routes including See It, Do It Sunderland, the Wear Xpress and the Black Cats. Sunderland City Council Portfolio Holder for Public Health, Wellness and Culture, Councillor John Kelly said: “The success of any event is down to planning and considering everything which makes it easier for visitors to enjoy, which obviously includes transport.